We proudly present the premiere performance of this year’s commissioned musical piece written by Safaa Al-Saadi. The composition is titled Broer av musikk and is the second piece to be commissioned by Global Oslo Music to an outstanding composer. Safaa Al Saadi is an Iraqi composer and multi-instrumentalist, living and working in Oslo, whose music is deeply rooted in tradtions from Mesopotamia. 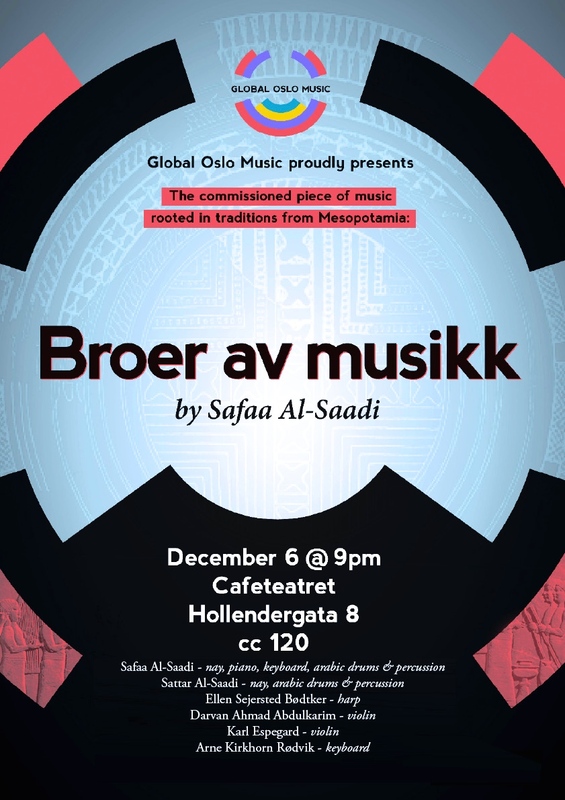 The work behind “Broer av musikk” is based on the study of instruments commonly used in Arab music in combination with Western European instruments. His use of Nay (reed flute), Darbuka, Rak, Kishbeh (drums/percussion) and violins (during the 19th century, the European violin began to replace the Arabic spike fiddle in most Arab countries), concert harp and keyboard has resulted in a powerful and innovative work. Funded by the Arts Council Norway, The City of Oslo and The Fund for Performing Artists. 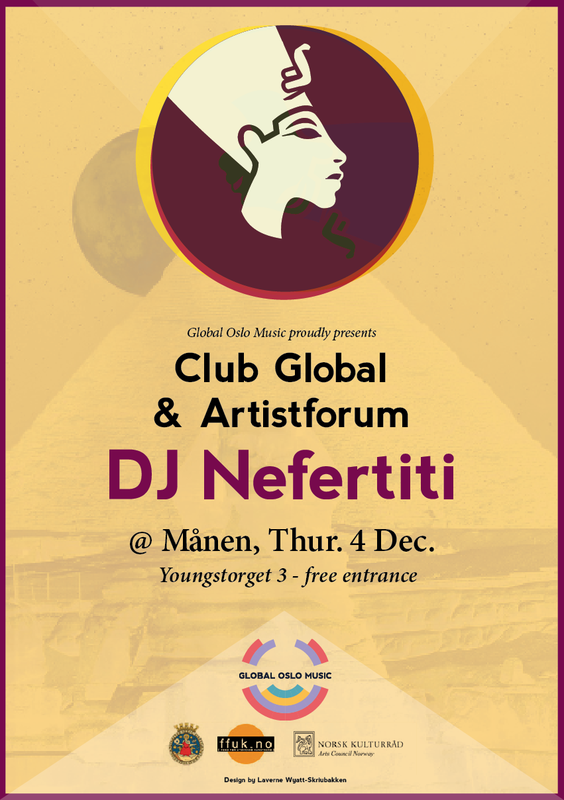 December 4: We proudly present DJ Nefertiti’s special show! Don’t miss our resident DJ Nefertiti’s last gig at Månen with the added bonus of special guests: Luis Landa-Schreitt – percussion, Sarah Camille – spoken word and DJ Ann Helen. The name DJ Nefertiti is taken from the Egyptian queen Nefretiti and behind it hides a 35-year-old woman originally from Somalia. Her musical vision is to show off a little known style of music to clubbers: She mixes Arabic pop music and South African electro. Spinning with her is Dj Ann Helen who has just escaped Oslo to settle in the country but keeps returning to the capital to spin her music. Known for a wide range of musical genres such as techno, house, disco, rumba, calypso, Afro-pop and psychedelia. Anything danceable is in the repertoire! Dj Nefertiti and Dj Ann Helen will be accompanied by musican Luis Landa-Schreitt on percussion and slam poet Sarah Camille, who also will be giving an introduction to their work as a part of the Artistforum’s tête-à-tête. Luis Landa-Schreitt is a well known drummer and percussionist who has performed extensively throughout Europe and staged the World Performing Arts Festival in Lahore, Pakistan. He plays a wide range of music and has collaborated with an array of artists such as, among others, Wolfgang Plagge, Stian Castersen, Per Arne Løvold, Reza Aghamir, Olga Konkova, Per Mathisen and Sher Mian Dad for live perfomances and recordings. Sarah Camille has become one of the country’s well know poet over the past years. She has been performing in various events in Norway and abroad, and she has been working with different productions in theatre/performing arts. Her expression plays with poetry, music, stories and language. She has studied « Storytelling » at Høgskolen i Oslo, and is currently a student at Norsk Barnebokinstitutt. In 2011 she won NM i poetry slam. Welcome to Global Career! We offer a wide range of art workshops and masterclasses, seminars and lecture series in the fields of fundraising in the arts and artist marketing. Supporting your passion: How to inspire sponsors, support from the ground up and creative funding, by Thomas Talawa Prestø. 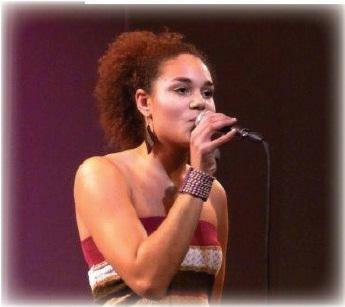 Introduction to slam poetry and spoken word, a creative workshop by Sarah Camille. 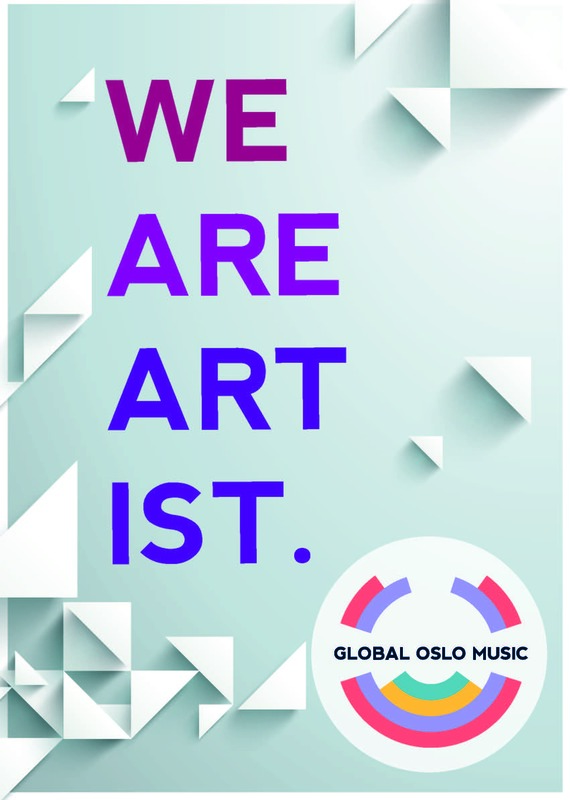 Introduction to arts grants and funding programmes, and a practical guide for writing proposals will be given by Global Oslo Music. Thomas is the founder of Tabanka Crew Dance Company. Since 1998 Thomas has spent his time actively carving a place for the black dancing body in Scandinavia. Close to 10 million people have seen his choreographies on stage, social media and internasjonal tv. Tabanka has toured 12 countries. In addition to Tabanka becoming a known international company, Thomas is most known for creating one of the worlds first codified African & Caribbean Dance Techniques. The technique is now taught on 4 continents and several universities. In order to create these things Thomas has needed to access support, backing and sponsorships in order to manifest his visions. Thomas will give a unique insight into how this is done, and how to sell your ideas and vision to potential sponsors. Song, poetry, storytelling, rap, melody and monologue are all elements that are used in slam poetry and spoken word. Each person is encouraged to express themself through own voice, identity and story to own the text and delivery. The Workshop has a written and vocal session. In the written session we will work with creative writing. We explore rhyme, rythm, methaphore, pictures, assosiation and different ways to develop a poetic style. In the vocal session we will work with dynamics in the voie, tempo, body language and other elements that can strengthen the performance. Sarah shares knowledge from own experience, meetings with other, and courses in her workshop.